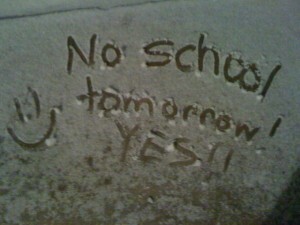 Sunday night, I received a text message from Lena’s school stating that it would be closed on Monday due to the weather. I quickly jumped on the Dallas ISD page and discovered that school was cancelled for all of my children. I gulped hard. A small flutter of panic rose into my throat. I have endured snow days in the past with everyone home and it wasn’t pretty or peaceful or restful, it was hell. Two years ago, we had a terrible ice storm hit Dallas and the city shut down for almost a week. Gray did not understand why we weren’t carrying on with our usual routines and stood at the door screaming. When the girls got bundled up to go play outside, Gray ran to join them. Of course, Gray was unable to tolerate a hat on his head or gloves on his hands, so playing outside proved even more frustrating than staying inside. As his hands turned bright red in the cold, he just stood there and screamed while little frozen tears dried on his cheeks. The only thing I could do to entertain him was to spin him in a chair or feed him goldfish crackers. By the third day, Gray was beating his head against the doors and windows in pure frustration over cabin fever. I would have felt sorry for him, but honestly, I was too busy feeling sorry for myself. I was willing to risk both my life and his by simply going out and driving around the city. I lived in the Northeast for a few years and learned to drive on slippery roads, so I felt like I could handle it. Of course, I couldn’t actually stop anywhere or patronize any open businesses because Gray would have been unmanageable and I could only imagine the carnage if he tried to elope and one of us slipped and fell during the chase. Sunday night, as I felt that old familiar feeling of dread, I tried to reassure myself that things are different now. I went to sleep praying that the roads would not completely glaze over and we could go out for a bit. I recently read an article that admonished parents for complaining about snow days. The author reminded adult readers about the thrilling feeling that kids get when school is unexpectedly cancelled and the negative message that we send our kids when we look disappointed about having to spend the day with them. I resolved not to be that mom. I awoke Monday morning to find Zoe standing in front of me with her school uniform. She looked puzzled as to why I was still in bed at 7:30am. When I told her that school was cancelled, her whole face lit up. When I realized that Gray was sleeping late that morning, I thought that it was a good omen for a peaceful day ahead. After a leisurely breakfast, I decided that we would venture out to accomplish a few errands. The girls were so happy to have an unplanned day off that they eagerly agreed to whatever I wanted. Thankfully, the roads were quite clear. We made a few quick stops before heading into the craft store to replenish our supplies for the afternoon ahead. I smiled to myself because I had a little flashback of the nightmare shopping trips that I reference in my post, entitled Shopping at Target, where Gray humiliated me when he pinched a man and threw his shoe at a woman. I knew that today would be different. While the girls were fluctuating between excitement and argument with each other, Gray was calm and happy. The girls were jumping out of the car and slipping around in the parking lot, but Gray exited the vehicle quietly and steadied himself with Hope’s handle. We entered the store in an orderly fashion and pulled a cart from the front. While the girls ran around and fought over which crafts to buy, Gray walked calmly beside me and helped me push the cart. He only grew agitated when we looped around our 10th aisle and showed no signs of leaving the store…but, I attribute that to general male shopping agitation. I can’t imagine a typical 8-year-old boy tolerating a trip to the craft store as long as Gray did. From the craft store, we headed to Central Market, a gourmet grocery store with samples galore. Usually, I am on a mission at the grocery store with a long list and limited time. 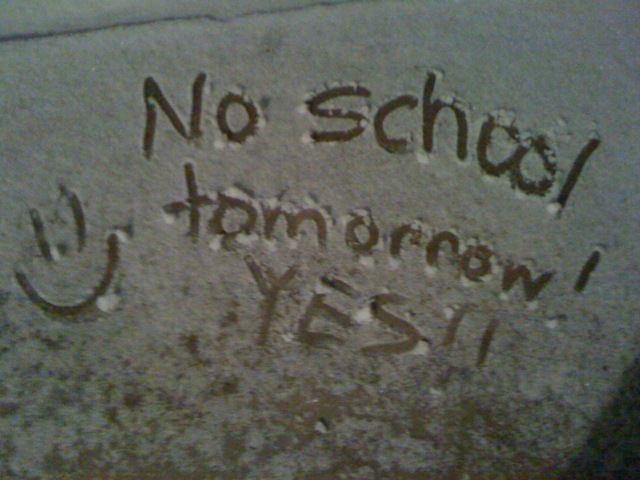 But, today was a snow day. THIS was our entertainment. With time on our hands, we slowly meandered through the store and stopped every time we saw a sample that appealed to us or an item that we wanted to try at home. Gray got equal billing in the choice-making. Through his iPad and pointing, we made as many stops per his requests as we did for anyone else’s. The result? $100 worth of novelty groceries, 2 hours killed, lunch-via-samples and no melt-downs. Arriving back home at 3pm, I felt very pleased with the day. Everyone had a good time, including me. It was the first snow day that I have enjoyed since I was a kid. But, then again, life is pretty enjoyable overall these days.